Kansas City saw their season come to an end this past weekend at Columbus. The Wizards now face the cold winter months as they plan ahead for 2009. But until then their first stop will be the Expansion Draft in a couple weeks. So far we have gone through Chivas USA, Colorado, DC, Dallas, LA, New England, San Jose and Toronto. And of course,� to recap about the rules, go here. Claudio Lopez – DP, gotta protect the DP. Jimmy Conrad – Nearly lead the club in goals this year, not to mention he is one of the best in the game. Josh Wolff – He came back to KC for a reason and I doubt they’d part ways like an expansion draft. Davy Arnaud – Getting some international camp duty now days, no reason to not protect him now. Jonathan Leathers – Their best rookie and one of their best defenders. Michael Harrington – Another young defender that they are trying to build with here. 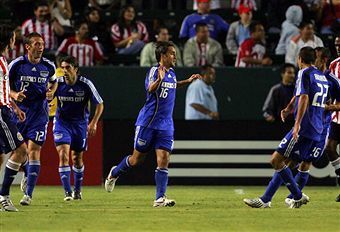 Herculez Gomez – Was a huge spark for them when he came over in a trade from Colorado. For a club with no offense they have to keep what little offense they do have. Tyson Wahl – Again, another young defender to keep. Abe Thompson – Another offensive part that they can’t get rid of yet. Jack Jewsbury – I feel like Jewsbury has been with the Wizards for years now but it’s only been five. Seems longer than that. I just can’t picture him not being on this club. Kevin Souter – One of their few internationals that they will protect. Kerry Zavagnin – They have too much young talent to protect and that leaves Zavagnin on the short end of the stick I think. Would Seattle go for an aged midfielder? They sorta already did with Ljungberg. Kurt Morsink – He was a guy they tried to use as an attacking midfielder this year. I don’t think that is his spot but I could see Seattle using him elsewhere. Ryan Pore – Another guy that could probably see more minutes elsewhere. Kevin Hartman – No need to protect Hartman in my opinion. Seattle won’t go for an aged keeper to backup an already aging Kasey Keller. Chance Myers/Roger Espinoza – GA contracts keep them protected no matter what. Good thing too because they would have had to at least protect Espinoza. Ivan Trujillo/Carlos Marinelli – I think these two will either get cut or something soon. Both were in the Onalfo Dog House at some point this year and I don’t see them staying on with the club into 2009. But I’ve been wrong about things in the past so who knows. Now I do have some doubts with a couple players on this list, a guy like Aaron Hohlbein could be protected or taken. But it all comes down to when they decide what to do with a couple players, most notably Trujillo and Marinelli. If they keep them then expect one or both to be protected (due to the rules). But at the end of the day I kind of see Seattle passing over this club in the draft. They only get 10 picks and that means four clubs will not be affected. KC just seems to me like they will be one of those four clubs. The favorite to be picked is 2nd year player Hohlbein. Zavagnin is retired as of the end of this season. Just started it recently but check out my blog, its under my URL. Actually, KC has to protect Ivan Trujillo. KC has 4 internationals (Lopez, Marinelli, Tujillo and Souter). We have to protect 3 of them. Which means that Thompson is probably not protected – though he is needed. They have to protect 1 of Trujillo or Marinelli, the rule is that they have to expose at most 1 international. They have 4 (Lopez, Souter, Trujillo, Marinelli), 4-3=1. Not to mention that Zavagnin is RETIRING! Seattle may not need an aging goalkeeper, but LA certainly could use Hartman (he used to play for them) and a trade for more picks or allocation money makes sense here. Unprotect Wolff, add Hartman. KCJ, I get LA needing a keeper like Hartman but protecting or not protecting Hartman has nothing to do with LA being able to trade for him. Protecting players only matters for the expansion draft, not for trades between other clubs. KCJ is talking about Seattle taking Hartman and trading him to LA for picks.